​Searching for information about different accounting career paths but unsure of where to start? Seeking personalized job advice? Elevate your future career path by joining Zicklin Graduate Accounting Society’s Mentor-Mentee Event! Participants will receive one-on-one personalized feedback and advice from accounting professionals. Professionals from the following organization have confirmed their attendance: Deloitte, EY, PwC, KPMG, Grant Thornton, BDO, RSM and more. Have you ever been asked to describe your Excel skills during an interview? Are you curious as to how accounting professionals use Excel to perform analysis in Audit, Tax, and Advisory? Join ZGAS along with GT professionals to gain insights on performing advanced Excel functions. Furthermore, come learn more about one of the most prestigious accounting firms in the country and the opportunities that it has to offer. Attendees will also have the chance to ask questions and network with GT professionals. The event will be a great way to sharpen up your excel skills and prepare for fall OCR. Are you looking for an internship but unsure of which industry to focus on? Unfamiliar with the on campus recruiting process? Join us for "Job Search Workshop with Jack Pullara", where we will share proven strategies of an effective job search. You have questions, we have answers! Jack, a former PwC Principal and current GCMC career adviser, is hosting this workshop to cover all job search related questions. The session is designed to be interactive, so participation is expected. Registration is open to all business students looking to learn the keys to a successful job search or preparing for the OCR cycle. Have a desire to distinguish yourself amongst professionals and learn what it’s like to be a public accountant at a top firm? Baker Tilly and ZGAS invite you to visit the firm’s Midtown office where you will learn the qualities that drive success and how the firm stands out among its competition. Come join Zicklin Graduate Accounting Society and Zicklin Women in Business in building your leadership toolkit with our EY female panelists! During the panel discussion, you’ll gain invaluable insights on how you can develop your leadership in a casual networking session. You’ll also have first-hand access to personal stories and career paths from EY panelists. Do not miss out on this opportunity to make a difference and develop your leadership talent! Ever wanted to meet a professional in a field of your interest in a small setting? Ever wanted to pick their brain and see what tips they have for you? Then join the Zicklin Graduate Accounting Society and the Baruch Accounting Society in the Mentorship Event. You will have the opportunity to sit down with a professional from a Big 4 or a mid-sized accounting firm for a 30 minute two-on-one session. Join Zicklin Graduate Accounting Society in developing your personal brand with KPMG! Professionals from KPMG will provide invaluable tips on how you can stand out from your peers and make recruiters notice you. Do you want to become a leader? Enhance your graduate students experience? Increase your exposure to accounting and taxation professionals? Make life-long friends? Then join the ZGAS Family! We are looking for motivated individuals who are passionate about making an impact! With the start of a new spring semester, ZGAS is excited to host our General Interest Meeting! ZGAS is the largest and most active graduate organization on campus, and our goal is to provide our members with networking opportunities with recruiters and professionals in the accounting industry. Meet the ZGAS board, snack on lunch, network with peers and learn about our upcoming events. Previous and current board members will not only speak on the impact ZGAS has had on landing their ideal job or internship but will also discuss open positions within the club and the application process. Join us at our General Interest Meeting, and get involved! Join us for Alumni Night, in which you can build long-lasting relationships with accounting and tax professionals from an array of companies in a relaxed, informal, and friendly environment. Also, use this opportunity to catch up with old and new friends from the Baruch community over delicious food and fun games! Join ZGAS and BAS for a corporate presentation with Gen II Fund Services, the largest independent, U.S. based, private equity fund administrator that covers over $235B of private capital, and learn more about what it takes to become a fund accountant. Fund administrators at Gen II are responsible for providing accounting services, including preparation and processing of transactions and financial statements. This is a great opportunity if you are looking to start your career in the private accounting/financial services industry. Gen II offers private equity firms the best-in-class combination of people, process and technology, enabling GPs to effectively manage their operational infrastructure, financial reporting and investor communications. The Gen II team is the most experienced and longest tenured team in the private equity fund administration industry, with broad expertise across buyout, infrastructure, energy, credit, real estate, co-investment, hybrid funds, fund of funds, feeder funds, venture capital and managed accounts. Do you know the value of a Ph.D. in Accounting? Have you ever dreamed of a degree that virtually guarantees you a great job, such as College and University professor, consultant, analyst, or public policy researcher? If you've answered "yes," then ZGAS’s Ph.D. Talk event is perfect for you! Zicklin Graduate Accounting Society is honored to invite Dennis Hickey, former CFO and current Vice-Chairman of Colgate-Palmolive, to share his perspective from an exceptional career and discuss his vision of the future. Do not miss this opportunity to learn about what it takes to build a successful career in corporate finance! ​Ever have questions about what Public accountants really do? Have doubts about what a day in the life of an accountant looks like? It’s time to get all your of questions answered. Grant Thornton is here to teach you first-hand about what a career in public accounting entails! Wondering how advanced technologies such as Artificial Intelligence, Automation and Data visualization skills affect your future career? 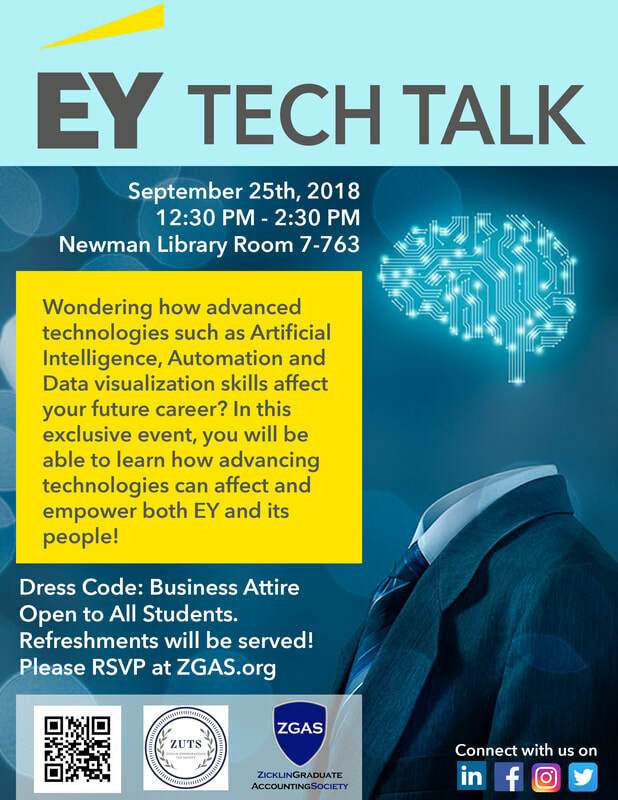 In this exclusive event, you will be able to learn how advancing technologies can affect and empower both EY and its people! Wondering if Deloitte is the right fit for you? Interested in audit and advisory service lines? Then RSVP for this event NOW! Hosted by ZGAS and BAS, this Deloitte panel will discuss various career-related topics and satisfy all curiosities with an open Q&A and networking session. We look forward to meeting all of you! It is with great pleasure that we invite you to join us for our Mock Interview Night Event at Baruch College! Mock Interview Event is our premiere event of the year. This event serves as a great way for students to practice their interviewing skills with professionals from different industries. The event will consist of three 25-minute mock interview sessions followed by an open networking session. Be part of ZGAS! Don't miss this opportunity to join the Zicklin Graduate Accounting Society! Selected candidates will be individually invited for an interview on September 12th, and results will be available two to three days after the interview. Join the ZGAS Executive Board, launch your leadership development and start building your professional network today! Thinking about the best way to start off your fall semester? Look no further and attend the Zicklin Graduate Accounting Society (ZGAS) General Interest Meeting! ZGAS is the largest and most active graduate organization on campus, and our goal is to provide members with numerous networking opportunities with recruiters and professionals in the accounting world. Members will not only be sharing their insight on how ZGAS has helped advance their leadership and career objectives but will also discuss open positions and the application process. Join us at our General Interest Meeting! We look forward to meeting all of you. Join ZGAS for Speed Networking with KPMG! KPMG professionals from audit, tax, and advisory are coming to share inside knowledge and to help you prepare for the coming OCR. Come chat with us over free food in a relaxed environment and make some new friends while gaining a decided edge over the competition this recruiting season. You don’t want to miss this chance. Spots are filling up faster than core classes on CUNYfirst, so sign up today! The On Campus Recruiting (OCR) taking place in the upcoming fall semester is the biggest recruiting event of the entire year! Do you have any strategies to distinguish yourself from other competitors? Attend our OCR workshop, led by former PwC partner Jack Pullara, to gain insight on how to best navigate through the recruiting process. Are you looking for more information about the CPA registration process? Are you planning on taking the CPA exam soon and have some lingering questions? Seize this opportunity to learn more about the new changes to the CPA exam and test prep strategies. Attendees will also have the opportunity to ask Becker professionals about the CPA exam and learn more about the Baruch College Fund CPA Review Program. We look forward to seeing you at the event, future CPAs! Our Networking Luncheon is on Tuesday, May 1st! For those who received an email confirming you RSVP, we look forward to seeing you! As a quick reminder, no resumes are allowed in this event. ​Are you seeking personalized advice on where to go from your current position, but don’t know who you should talk to? If yes, our event is what you are looking for! ZGAS invites you to join our “Mentor-Mentee Event”. Participants will get one-on-one personalized advice from professionals in Big 4, midsize firms, and financial institutions. The deadline to register is April 19th at 11:59 PM. Seats are limited, so don’t miss your chance and apply today! Join us for a bootcamp to learn more about an exciting career in tax and financial services industry! Brendan, a tax associate at RSM and recent graduate from Baruch, will share with us his daily responsibilities, the varying engagements he works on, and his insights on starting your career in tax. RSVP now using the link below. You don’t want to miss this great opportunity! Refreshments will be served! We look forward to seeing you! Are you struggling to write a cover letter? Are you worried about how to stand out? Don't let opportunities pass you by! Grab a seat at NVC 14-290 on Apr 19th, 2018 for an exclusive workshop on how to get recruiters to read and remember your cover letter. What are the advantages of having a career at a mid-size accounting firm? Join us in learning about mid-size advantage with Baker Tilly and their upcoming opportunities on Tuesday, April 17th! Tired of dropping resumes in the cold void of the web? Tired of digging through emails for replies that never come? You're not alone. Come join the ZGAS Job Search workshop with Jack Pullara, former PwC Partner and GCMC guru. Watch as he demystifies the job hunt process and reveals how you can smash through the numbers game. So tab out that Facebook and RSVP today! Have a burning desire to distinguish yourself and amongst professionals in the accounting and tax industry? Baker Tilly invites you to an office visit to network with representatives in the industry in order to gain more insight and perspective on daily operations and experiences in a top public accounting firm! Join the CUNY Crypto Club at Baruch College, Zicklin Undergraduate Tax Society, Zicklin Graduate and Undergraduate Accounting Society to know more about on the future of Cryptocurrencies and Tax implications with Professor Michael Meisler. Michael Meisler is a Tax Partner within Ernst and Young's (FSO) financial services office and is also a tax leader in global Blockchain as well as New York Fintech. 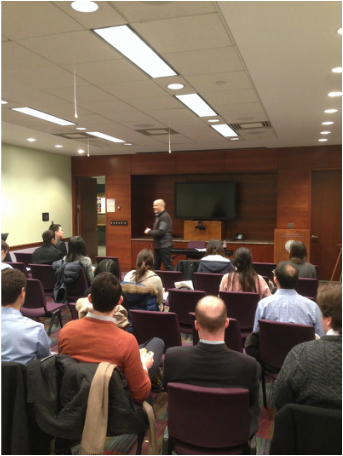 Michael graduated from NYU Stern and school of law and he currently teaches at Baruch's Stan Ross Department. He will touch upon the underlying rationale and future development of Cryptocurrency and relevant federal tax regulations and implications. Journey to Manager with WISS & Co. Learn about the student opportunities at Wiss & Co. and hear the experiences of Wiss & Co. professionals! Network with your peers and professionals from the firm as well! Join Zicklin Undergraduate Tax Society & Zicklin Graduate Accounting Society to speed networking with Goldman Sachs! This is an opportunity that you definitely don't want to miss out on. Come and network with Goldman Sachs professionals from Finance Divisions and get to know more about the culture of this industry-leading investment bank. *You must RSVP in order to be considered to attend this event. Zicklin Graduate Accounting Society and Zicklin Woman in Business are proud to present “Woman in Business Panel Discussion" on March 6th ! Join us in celebrating the successful women as we approach the International Women’s Day! Our female panelists from companies, such as EY and Colgate, will inspire and share their own personal messages with us about their career paths and their success in their fields. Do not miss this exceptional chance to gain insights and network with recognized leaders! In this panel discussion, professionals from different industries will share their insights about the tax reform bill. Grab your seat at NVC 14-270 on Feb. 27th, 2018 for a chance to see how the new tax law impacts you, your family, or your business. Also be sure to bring plenty of questions to ask our panel of CPAs and to discuss with your peers during open networking. Check committee responsibilities and apply now! Shortlisted candidates will be individually invited for an interview. ​Start your semester off right by attending the Zicklin Graduate Accounting Society (ZGAS) General Interest Meeting! As one of the largest and most active graduate societies on campus, our goal is to provide our members with numerous networking opportunities with recruiters and professionals in the accounting world. In the coming spring semester, we’ll organize professional events such as mentor-mentee events and networking events with the Big 4 and mid-size companies. At the meeting, current board members will speak about how ZGAS helped further their career objectives, and Mr. Jack Pullara will explain how ZGAS can help you develop your leadership skills. We will also discuss open positions and offer advice on how you can get the most out of our events. Come join us at our General Interest Meeting. We are looking forward to seeing you there! ​Join us to celebrate the launching of the semi-annual "Alumni Night" with games, music and open networking with alumni from different clubs! Students will be offered an opportunity to network with professionals in a casual setting. Food and light music will be provided. This event offers students networking resources that are crucial to their professional development, and aids them in preparation for recruiting. Alumni night has been previously held in Spring 2016, Fall 2016, and Spring 2017. The event will be composed of 4 sessions specified below. Professionals will have an opportunity to introduce themselves and the company they work for. During the ice breaker game, students and professionals will have an opportunity to get to know each other. We will close the event with the open networking session. ​Tired of unsuccessful OCRs and job searches? Ever wonder how to make a search work for YOU?! Do you know the value of a Ph.D. in Accounting? Have you ever dreamed of a degree that virtually guarantees you a great job, such as College and University professor, consultant, analyst, or public policy researcher? If you answered "yes" to any of these questions, then come join ZGAS's Ph.D. Talk and have all your questions answered! In business, it's not only about what you know, but also who you know. Join us on Tuesday evening, November 14th, for our powerful tax networking event that comes with a unique twist. We have 8 Tax professionals from EY, PwC, KPMG, BDO and RSM. Three rounds of discussion allows you to communicate with professionals from various tax areas. Meaningful connections are made instantly! Register early before the event closes out, and feel free to forward this invitation to your classmates! Are you planning on taking the CPA exam soon and have some lingering questions? 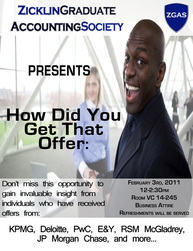 Join us for EY's Ace the Interview co-hosted by ZGAS and Ascend Baruch, an interview skills workshop. Learn new interview skills and how to showcase your personal brand! Undergraduates & Graduates Welcome! Are you looking to improve your interview skills? Do you want to receive valuable feedback on your interview techniques? The Zicklin Graduate Accounting Society (ZGAS), Graduate Beta Alpha Psi (GBAP), and Graduate Career Management Center (GCMC) are proud to present the Mock Interview Morning. Participants will have the opportunity to conduct 40-minute mock interviews with professionals from finance and accounting backgrounds. Through these 40-minute sessions, participants will receive feedback and tips from professionals to polish their interview skills. Interested in joining Deloitte? Trying to find out what kind of career path you could have at Deloitte? Join our panel discussion with Deloitte professionals who will share their unique experiences of finding their career paths at the firm. Come with your questions and learn about how Deloitte support professionals in building their careers. This is an excellent opportunity for students to learn more about Deloitte and discover how Deloitte helped these professionals in achieving their goals. Speakers from different practices will discuss the opportunities and challenges students may face when choosing and embarking on their journey. This event is open to both graduate and undergraduate students. Join ZGAS and ZWiB on Thursday, September 14 for a panel discussion with PwC professionals who will guide us through the various service lines in the public accounting profession and talk briefly about their job experience. Speakers from Tax, Assurance, and Advisory service lines will explain the functions of the different service lines, share insights on what they enjoy about their career, and provide tips on choosing and succeeding in the line that best suits you. Moderated by our very own Tanuja Ramchal from Zicklin GCMC, students will have the opportunity to learn about PwC’s service lines and career opportunities during the panel event, ask questions, and network with professionals afterwards. Come get the inside scoop and the PwC edge during OCR this year! *Space is limited! Participants must RSVP at ZGAS.org to be admitted. Don't miss this opportunity to join the Zicklin Graduate Accounting Society! Selected candidates will be individually invited for an interview on September 13th, and results will be available two to three days after the interview. Join the ZGAS Executive Board, launch your leadership development and start building your professional network today! Join ZGAS and ZGTS for Speed Networking with KPMG! KPMG professionals from audit, tax, and advisory are coming to share inside knowledge from each service line and to help you prepare for the next big step of your career. Come chat with us over free food in a relaxed environment and make some new friends, all while gaining a decided edge over the competition this recruiting season. You don’t want to miss this chance, and spots are filling up faster than core classes on CunyFirst, so sign up today! m, speak about career opportunities, and answer questions. Don’t miss the chance to gain valuable insights from professionals in various service lines at one of the top mid-sized accounting firms. Reminder: Grant Thornton does not provide work-related visa sponsorship. Students in inappropriate attire will not be admitted. Welcome both new and returning students: your dream career awaits! Start your semester off right by attending the Zicklin Graduate Accounting Society (ZGAS) General Meeting! As one of the largest and most active graduate society on campus, our goal is to provide numerous networking opportunities for our members with recruiters and professionals in the accounting world. In the coming fall semester, we’ll organize professional events such as accounting panels, mock interview workshops, networking events with the Big 4 and mid-size companies. We create a platform for students to gain a better understanding of the issues and opportunities in the accounting industry and the business world in general. Why should you join the ZGAS Executive Board? At the meeting, current board members will speak about how ZGAS helped further their career objectives, and Mr. Jack Pullara will explain how ZGAS could help you develop leadership skills. We will also discuss open positions and offer advice on how you can get the most out of our events. Come join us at our General Meeting. We are looking forward to seeing you there! Have you been preparing for OCR and don't know where to start? Have you wondered what questions would be asked in an interview? Are you looking for ways to capture a recruiter's attention and stand out? OCR Bootcamp with Jack Pullara will cover these questions and more! Zicklin Graduate Tax Society (ZGTS) sincerely invite both graduate and undergraduate students to our tax networking event on 5/9 cohosted with Zicklin Graduate Accounting Society (ZGAS), Ascend Naamba Baruch, and Ascend Baruch. In this event, you will have opportunity to network with 10 tax professionals from EY, Deloitte, KPMG and CohnReznick and purely enjoy a relaxing and helpful talk in a roundtable setting. You’ll have opportunity to learn about tax as a career choice and how should you prepare for this career as well as OCR next semester. Have you ever tried to connect with professionals from LinkedIn and never got any feedback? Have you been searching for information about the different accounting career paths but don’t know where to start? Are you seeking personalized advice on how to get started or where to go from your current position but don’t know who you should talk with? If yes, our event is what you are looking for! Zicklin Graduate Accounting Society invites you to join our “Mentor-Mentee” event where participants will get individual, one on one personalized advice from professionals. Professionals from the following organization have confirmed their attendance: Deloitte, EY, PWC, KPMG, Grant Thornton, Crowe Horwath, RSM and Baker Tilly. In order to be eligible for participation, applicants are required to submit their resumes. Based on your individual professional interests, you will be matched with mentors from audit, tax, advisory, or other accounting/financial fields. During the 25-minute mentoring sessions, mentors will give participants feedback and answer questions about anything the participants have in mind. There are a limited number of seats available, so don’t miss your chance and apply. The deadline to register is April 12th at 11:59 PM. A confirmation email with your matching information will be sent to you before the event. If you have any questions regarding the event, please email us at join.zgas@gmail.com. Ever wonder about how professionals deal with conflicts, maintain client and employee relationships, or enhance productivity at today’s fast-paced work environment? Want to have an in-depth discussion with PwC professionals and hear about their unique experiences of effective communication in the workplace? In this event, you will be assigned a communication-based scenario and discuss the solutions with a PwC professional in a round table. Come with your questions and learn about how to create an open communication in the workplace to effectively interact with clients and team members. This is an excellent opportunity for you to leverage your communication skills so as to achieve a successful career. Are you curious as to how accounting professionals use Excel to perform analysis in Audit, Tax and Advisory? 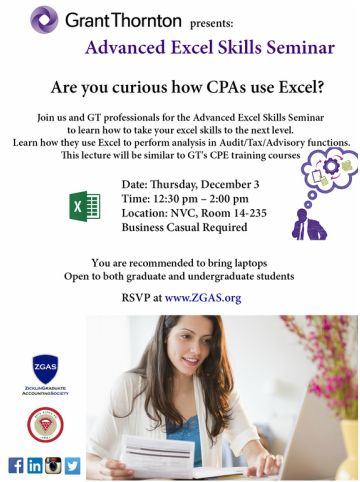 Join ZGAS along with GT professionals to learn some tips and tricks for performing advanced Excel functions. The lecture will be similar to GT’s CPE training courses and will give you the opportunity to master Excel skills and productivity in just one workshop. Also, the GT recruiting team will join us and host an info session during the workshop. Come learn more about the firm and the opportunities that they offer. Attendees will have the chance to ask questions and network with GT professionals as well as the recruiter. This is a great way to prepare for fall recruitment. Did you know that the AICPA is launching a new version of the Uniform CPA exam on April 1, 2017? Are you interested in knowing more about the upcoming changes on the exam? This information session will cover those changes and answer any question/concerns you might have about the new version of the CPA and will introduce Baruch College Fund CPA Review Program. A recruiter from Baker Tilly will also join this event, share her views on CPA candidates, and provide valuable insights about employment opportunities. Want to have an in-depth networking session with professionals? Want to sharpen your soft skills in a real-world scenario working together with a professional? In this event, you will be assigned a typical scenario during busy season and discuss the solution with a professional in a round table. Come learn about how Baker Tilly professionals use soft skills to deal with perplexing situations at work and leap forward in their careers. *Space is limited! You must RSVP to be admitted. Sign up starts from 11:45 am. *Reminder: Baker Tilly does not provide H1B visa sponsorship. *Seating is limited and on a first come first serve basis. As women, it is important that we embrace our strengths and acknowledge that our differences can be an advantage. Come join us to hear Big 4 female leaders share their stories of succeeding in a male-dominated industry and in breaking the glass ceiling. In this event, you will also learn what initiatives Deloitte and EY has provided to support their female professionals. Don’t miss this chance to navigate your career and network with our panelists! Think job hunting is a numbers game? Sent out hundreds of applications but got few responses? Come to this event and stop the numbers game! After 15 years at PwC, Jack has turned his focus on professional and career coaching. In this event, Jack Pullara will show you how to write a winning resume and tell you what you need to stand out in this competitive job market. Don't miss this opportunity to join the Zicklin Graduate Accounting Society! Selected candidates will be individually invited for an interview and results will be available in two to three days after the interview. Join the ZGAS Executive Board, launch your leadership development and start building your professional network today! Welcome both new and returning students: your dream career awaits! Start your semester off right by attending the Zicklin Graduate Accounting Society (ZGAS) General Meeting!Why should you join the ZGAS Executive Board? At the meeting, current board members will speak about how ZGAS has helped further their career objectives, and Mr. Jack Pullara will explain how ZGAS could help you develop leadership skills. We will also discuss open positions and offer advice on how you can get the most out of our events. Come join us at our General Meeting. We look forward to seeing you there! standards are set in the US? The Zicklin Graduate Accounting Society (ZGAS) is honored to host Norman Strauss, former EY's National Director of Accounting Standards, to be our guest speaker. Through interesting stories and a few technical examples, you will have a great opportunity to learn useful and hands-on knowledge you would not be able to learn from a class. Have your questions answered by an expert in financial reporting and the FASB standards. Don’t miss this unique opportunity! We have limited seating so sign up today! All majors are welcomed, graduate and undergraduate students. Ever heard about the story of an inside trader who cooperated with the federal government, resulting in over 90 convictions throughout hedge funds? Come to the Beyond Operation Perfect Hedge: The Roomy Khan Story event hosted by ZGAS, GBAP and Robert Zicklin Center for Corporate Integrity! Roomy Khan has over 20 years of combined professional experience in the technology industry and in Wall Street, and was intimately involved in the Galleon insider trading case. Operation Perfect Hedge was one of the most successful and aggressive investigations into wrongdoings on Wall Street. Roomy's case and her role have been cited extensively in newspapers and televisions, and now she is telling her story at Baruch! Are you taking the CPA exam soon? Don't know what you need for the CPA registration process? Are you interested in hearing about CPA exam changes that are being implemented now and finalized April 2017? This information session will cover those changes, answer any questions/concerns you might have about the CPA exam, and will give information about the Baruch College Fund CPA Review Program. We look forward to seeing you at the event, future CPAs! The Zicklin Graduate Accounting Society, Zicklin Women in Business and the Graduate Career Management Center are proud to present the Student Mock Interview Morning. This is not a recruiting event, rather it is a practice exercise for students to have a 45 minute mock interview with professionals who work in various positions, including recruiting, accounting, finance, marketing, audit, HR and taxation. Each student matched will have a 45 minute mock interview, during which time they will have a mock interview and receive feedback from the professionals with whom they are matched. Well organized resume is required. Baker Tilly is one of the top 12 largest accounting firms in the U.S., offering audit, tax, and advisory services. In particular, it specializes in non-profit and real estate accounting. It was rated one of the best companies to work for in New York in 2016 as well as one of the top places to work for women. Don’t miss your chance to learn more about Baker Tilly and the overall benefits of working for a mid-sized accounting firm. Furthermore, you will have the opportunity to have your questions answered about the company, OCR positions, and everything else. Space is limited! You must RSVP to be admitted. Reminder: Baker Tilly is not an H1B Visa sponsor. You’ve secured an interview? Congratulations! At this point, you’ve most likely done some research about the company and gone through all kinds of questions that you will be asked. What is the next step? You need to go in with confidence and connect with your interviewers! Come to our discussion with EY professionals to learn about how to showcase your personal brand and interview with confidence! Looking for connections with KPMG? Curious about what is going on in each service line? Come to ZGAS and BAS joint event “Speed Networking with KPMG” and learn more about the firm and service lines while sharpening your networking skills. Struggling to find your career path in accounting or tax? Trying to find what service line you are interested in? Join our panel discussion with Deloitte professionals who will share their stories of learning, networking and discovering their careers at the firm. This is an excellent opportunity for students to discover which accounting career path is right for them. Speakers from different Deloitte practices will elaborate on the opportunities and challenges students may face when choosing and embarking on their journey. Don't miss this opportunity to join the Zicklin Graduate Accounting Society! Selected candidates will be individually invited for an interview on September 12th, and results will be available two to three days after the interview. Join the ZGAS Executive Board, launch your leadership development and start building your professional network today! Please read the board responsibilities and fully understand the position expectations. ​Ever wondered what life is like at mid-sized accounting firms? What the culture is like? Come join us in networking with Grant Thornton! At this event, you’ll learn from professionals in various service lines at one of the top mid-sized accounting firms. You must RSVP to be admitted. If you cannot attend the event for any reason, please kindly cancel your RSVP (email join.zgas@gmail.com) by September 6th, 5:00 p.m. Failure to do so may result in a ban from participating in future ZGAS’ event. Since this is a closed event, you are expected to stay throughout the event. Join the ZGAS General Meeting to gain insight into the largest and most active graduate society at the Zicklin School of Business! With over 2000 members, ZGAS offers the most opportunities to expand your network and enhance your professionalism. Open board member positions are available and will be introduced in the general meeting. Planning on participating in OCR but not feeling prepared? Looking for a competitive edge? Do you have questions like, “What does an auditor do?” or “What kinds of questions are asked in an interview?” These and many other OCR-related questions will be covered in this full-daySaturday workshop. Jack Pullara, a former partner from PwC and current GCMC advisor, will be facilitating the workshop. The sessions are designed to be interactive (audience participation is expected). Attendance is open to any Zicklin graduate student who is planning on participating in the Fall OCR cycle (either targeting a summer ’17 internship or fall ’17 full-time position in audit/assurance, tax, or advisory). *You must register via Zicklin CareerLink. Space is limited and the cancellation policy applies (if you register and can no longer attend, you must cancel by 9am Friday, 8/26 or a “no show” will be recorded). We encourage you to arrive on time. If you arrive late, seats may not be available. Full agenda to be provided shortly. It’s almost the end of another fruitful semester! As a thank you for all of your help and hard works in making our events successful, ZGAS, ZGTS, ZFAA, and GBAP have come together to throw an appreciation party! Please come by to celebrate and mingle with us! All graduate accounting students are welcome to attend. This event is co-hosted by ZGAS, ZGTS, ZFAA, and GBAP. The event is open to all graduate accounting students. ​Are you curious about the different accounting career paths such as audit or tax, public vs. private, or even how to get started in this field? Take a sneak peek into your future career by joining ZGAS’s Mentor-Mentee Event! Seize the opportunity to connect one on one with professionals from the Big 4 and various mid-sized accounting firms. In order to be eligible for participation, applicants are required to submit their resumes. Based on your individual professional interests, you will be matched with mentors from audit, tax, or advisory. During the three 25-minute mentoring sessions, mentors will give feedback and answer questions about anything that participants have in mind. Throughout the event, there will be open networking opportunities with the professionals. Come join us to build your network and learn more about the accounting profession! There will be a limited numbers of seats available in order to provide quality time with mentors, so apply early. Don’t miss the biggest accounting event of the semester! Apply by Friday, April 15. A confirmation email with your matching information will be sent to you before the event. If you have any questions regarding the event, please email us at join.zgas@gmail.com. *Students will need to arrive at least 10 minutes prior to his/her sessions. Both graduate and undergraduate students are welcomed. Graduate students will get priority in the matching process. In this panel discussion, PwC professionals will share their inspiring stories of career transitioning, how they got to where they are and how PwC had helped them in the process. By attending this event, you will learn more about PwC and their internal transfer procedures. This is an excellent opportunity for accounting students who are debating which service line to pursue. Professionals will share their insights on what they enjoy in their work and what motivated them to change careers. You may learn what service line is best suited to your goals and personality through the discussions. Learn new financial reporting issues that textbooks can’t teach you from Dan Noll. Are you fully informed about the recent changes in financial reporting for your first job, internship, or forthcoming job interview? Do you want to know all the works behind accounting rules and standards? The Zicklin Graduate Accounting Society (ZGAS) is honored to host Daniel Noll, Director of Accounting Standards at the AICPA, to discuss hot topics in financial reporting and accounting standards. A fellow Baruch alum, Dan will also talk about his own career with PwC and the AICPA. This is your opportunity to gain useful and practical knowledge that you can’t get from a classroom. It’s a great opportunity to have your questions answered by a man who is an expert in financial reporting and accounting standards. Planning to take the CPA exam? Did you know major exam changes will start to be implemented July 2016 and continue until formally changed in April 2017? Making the exam longer, harder, and more expensive? This information session will cover those changes and answer any questions/concerns you might have about the CPA exam as well as information on the Baruch College Fund CPA Review Program. Do you ever experience challenging situations that stress you out at work? Want to join an engaging and exciting event where you will have the opportunity to have direct conversations with recruiter and professionals? During this event, you will have the opportunity to work with EY professionals and brainstorm ideas on how to tackle challenging situations in the workplace. Please join us at this event, we guarantee you will gain insights along with a lot of fun! Seating is limited and on a first come first serve basis. RSVP soon to reserve your spot! ​One study found that 90 percent of firing results from interpersonal relationship problems and substandard interpersonal skills. Soft skills are imperative skills that can save you from tragically losing your job. At work, you are likely to face instances that put you in a corner and make you feel uncomfortable. Imagine having to continuously work with people you do not go along with. The chances are that your coworker, client, or boss will not change for you, and you will need to utilize your soft skills to make your situations more agreeable. Our Zicklin Graduate Clubs, looking out for fellow students, would like to invite you to an event that will prepare you for your stress reduced career. A panel of three professionals from Deloitte will join us for this event to share their experience or insights on dealing with certain difficult situations at work. Furthermore, you will get to test and strengthen your team-building soft skills by answering Jeopardy game questions as a group. Please RSVP for this event to learn how to act at work and possibly win an exclusive gift from Deloitte! Do you know what it takes to land your dream job come recruiting season? Don't miss this opportunity to join the Zicklin Graduate Accounting Society! The deadline to submit an application for the Spring 2016 election is Sunday, February 7th at 11:59 PM. Shortlisted candidates will be individually invited for an interview on February 11th, and results will be available two to three days after the interview. Grant Thornton Presents "Advanced Excel Skills Seminar"
Have you ever been asked “Describe your Excel skills?” during an interview? Are you curious how CPAs use Excel? Do you need to develop your Excel skills? Join us and GT professionals for the Advanced Excel Skills Seminar to learn how to take your excel skills to the next level. Learn how they use Excel to perform analysis in Audit/Tax/Advisory functions. It’s almost the end of the semester, ZGAS, ZGTS, ZFAA, and GBAP have come together and planned a celebration party. Please join us at the party to celebrate the end of a fruitful semester. This is a great chance for you to meet your fellow students and mingle with each other. There will be games, small prizes and food offered. All graduate accounting students are welcome to attend. Seats are limited, please RSVP at http://zgasappreciationparty.eventzilla.net. This is an event co-hosted by ZGAS, ZGTS, ZFAA, and GBAP. 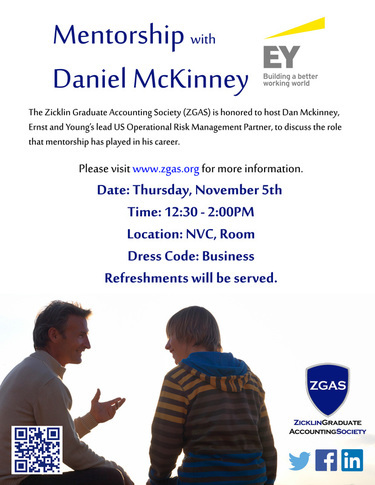 The Zicklin Graduate Accounting Society (ZGAS) is honored to host Dan Mckinney, Ernst and Young’s lead US Operational Risk Management Partner, to discuss the role that mentorship has played in his career. With approximately 25 years of industry experience in capital markets, banking and broker/dealer operations, as well as, risk management, compliance and audit, Dan advises global financial institutions on best practices for developing a framework to manage and control operational risks inherent to their business. This is an exciting and important event for all Zicklin School of Business students! You don’t want to miss this privileged opportunity, so sign up today as space is limited! All majors welcome! Refreshments will be served. Get your CPA Exam questions answered by the expert himself – Peter Olinto! 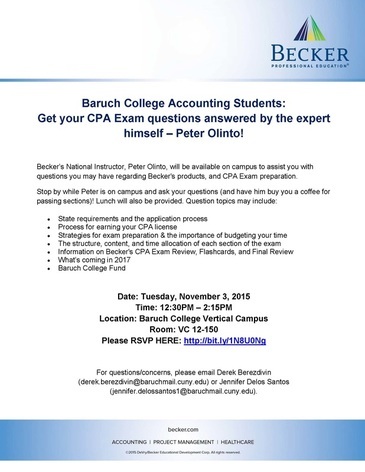 Becker’s National Instructor, Peter Olinto, will be available on campus to assist you with questions you may have regarding Becker's products, and CPA Exam preparation. Attend ZGAS’ “Hot Topics in Accounting” event to learn about Audit Analytics and how it will shape the future of the auditing field. Join a panel of experienced Deloitte professionals who deal with audit analytics every day as they talk about the challenges and opportunities that its emergence brings, as well as the implications that it may have on the future of auditing. This is an excellent opportunity for future auditors to learn more about where their field is heading and to understand the type of skills that will be most valuable to them in their careers. The event may also provide you with some excellent talking points for upcoming second round interviews. The Zicklin Graduate Accounting Society (ZGAS) welcomes you to “EY Presents: Ace Your Interview” on Thursday, October 1, 2015. This is a perfect chance to improve your interview skills with experienced professionals. Space is limited and registration is required. Please submit your application by 11:59 p.m. on Friday, September 25, 2015. We encourage you to practice your interview skills with GCMC advisors prior to the event. They will be able to provide tips on the best way to approach and communicate with professionals for this event. ​The Zicklin Graduate Accounting Society (ZGAS) invites you to join our “Baker Tilly Information Session” on Thursday, September 24, 2015. Baker Tilly is one of the top 12 largest accounting firm in the U.S., offering audit, tax, and advisory services. In particular, it specializes in non-profit and real estate accounting. It was rated one of the best companies to work for in New York in 2015 as well as one of the top places to work for women. Don’t miss your chance to learn more about Baker Tilly and the overall benefits of working for a mid-sized accounting firm. Furthermore, you will have the opportunity to have your questions answered about the company, OCR positions, and everything else. An open networking session will follow the firm's presentation. RSVP is required and space is limited. This event is open to graduate and undergraduate students. Business attire is required. Refreshments will be served. The Zicklin Graduate Accounting Society (ZGAS) welcomes you to “Speed Networking with KPMG” on Wednesday, September 16, 2015. You can learn what it is like working with KPMG by interacting with representatives from the firm. Start your fall semester networking with KPMG! This is the best chance to appeal your competence with an elevator pitch and build your personal level connection. Explore the career path in one of the “Big 4” and find out if KPMG is your ideal workplace. Mingle with professionals at “Speed Networking with KPMG” before the actual interviews during recruiting season! Once selected, you will meet a professional and form a small group of students for 15-minutes. You will meet with two different professionals to broaden your chance to learn. Please select your preferred time slot between Group 1 and Group 2. The Zicklin Graduate Accounting Society (ZGAS) welcomes you to “Speed Networking with Grant Thornton” on Thursday, September 10, 2015. You can learn what it is like working with GT by interacting with representatives from the firm. Interested in learning more about life at a mid-sized accounting firm? Attend ZGAS' Grant Thornton Speed Networking Event! At this event, you will have the opportunity to mingle with professionals from various service lines. Space is limited! RSVP today! Once selected, you will have the opportunity to meet professionals in different service lines in five ten-minute rounds of speed networking. If you cannot attend the event for any reason, you must cancel by September 8, 2015, 11:59 pm to avoid a lack of participation penalty in future ZGAS events. If you have any questions regarding the event please e-mail us at join.zgas@gmail.com. Don't miss this opportunity to join the Zicklin Graduate Accounting Society! The deadline to submit an application for the fall 2015 election is Sunday, September 6th at 11:59 PM. Shortlisted candidates will be individually invited for an interview on September 10th, and results will be available two to three days after the interview. At the meeting, current board members will speak about how ZGAS helped them land their dream jobs or internships, and Mr. Jack Pullara will explain how ZGAS could help you develop leadership skills. We will also discuss open positions and offer advice on how you can get the most out of our events. Do you understand the importance of On-Campus Recruiting (OCR)? Have you prepared your weapons for success: resume, cover letters, LinkedIn profile? The intense recruiting season is approaching so be prepared for the competition! Attend OCR Boot Camp where our career advisory guru, Jack Pullara, will guide us through the dense fog. Don't miss this precious opportunity to get yourself ready for OCR! Interested in gaining interview and networking experience with professionals and recruiters from the Big 4 and Mid-sized accounting firms? Come to the very first Accounting CareerFest for the unique opportunity to receive insider feedback and interview tips from established accounting professionals and recruiters. Build your connections and get a head start on competition before the recruiting season begins! There will be up to 50 professionals from Big 4, mid-size, and private firms (including recruiters!). Each student will get two 20-minute mock interview sessions, during which one-on-one interviews with recruiters and professionals will be held, and also have the opportunity to speed network with professionals from many of the top firms in accounting. Please join our ZGAS for an engaging and exciting event when Sam Antar, the convicted felon and CFO of Crazy Eddie, speaks about white-collar crime! During this event, Mr. Antar will describe how he conducted one of the biggest financial frauds of the 20th century and how he leverages his criminal experience to serve as a whistleblower. Mr. Antar will also bring several forensic accountants as guests. You will have the opportunity to learn more about white-collar crime, ask questions and network. Are you ready for the coming recruiting season? Are you preoccupied with On-Campus Recruiting (OCR) and job applications? ZGAS invites you to join a panel of peer professionals who will share their secrets on successfully landing job offers. Don’t get lost in the crowd and register today! On Tuesday, March 31st 2015, from 12:30pm-2:00pm Becker Professional Education will be on campus hosting a Pathway to the CPA Event to give Baruch students a glimpse at example questions from each of the 4 sections of the CPA Exam and to ensure each student, prior to starting with a firm full-time, understand the ins and outs of sitting and applying for the CPA Exam. Are you new to the accounting field? Have you switched careers and are unsure what to expect? Do you want to know what it’s like working at PwC? If you answered yes to any of these questions, then this event is for you! The Zicklin Graduate Accounting Society (ZGAS) welcomes PwC professionals to discuss their experiences at the firm and key skills that are helpful in public accounting. Do you ever experience challenging situations that stress you out at work? Want to join an engaging and exciting event where you will have the opportunity to have direct conversations with professionals? Through a creative role play format, EY professionals and students will discuss ways to deal with difficult workforce situations. At this event, you will gain insights along with a lot of fun! The Zicklin Graduate Accounting Society (ZGAS) is honored to host Mr. Lawrence Zicklin, who will lead a discussion on business ethics and corporate integrity, and how such issues apply to all students in business school. This is an exciting and important event for all Zicklin School of Business students! Now is your opportunity to hear from and have your questions answered by the man whom Baruch’s Zicklin School of Business is named after. Mr. Zicklin is also the founder of Baruch’s Robert Zicklin Center for Corporate Integrity. If you don’t want to miss this privileged opportunity, sign up today as space is limited! All majors welcome! Interested in making the most of your accounting major and landing your dream job? Wondering how to convert your academic success into professional success? Join the Zicklin Graduate Accounting Society (ZGAS) and GCMC Advisor, Jack Pullara for the "Top 10 Tips on How to Succeed as an Accounting Major" workshop, and get answers to those questions and more! All majors welcome! Refreshments will be served. Why be part of the ZGAS Executive Board? available on our board and offer advice on how you can get the most out of our events. Come and join us at our General Meeting. We are looking forward to seeing you there! The Zicklin Graduate Accounting Society (ZGAS) invites you to join our “Mentor-Mentee” event. Would you like to get individualized advice from alumni who are now experienced professionals in the accounting field? Now is your chance to participate in this unique event! Build your network, get career guidance, and connect on a personal level with some of the best in the accounting industry. You will have the opportunity to connect with professionals from both the Big 4 and mid-sized accounting firms. Come learn more about your target firms and service lines! If you are selected to participate, you will be assigned one or more twenty-minute mentoring sessions. During these sessions, mentors will give you feedback and answer your questions about their firms, your prospects in the field, and anything else you have in mind. The deadline to register is Nov 7th, 11:59 pm. If you cannot attend the event for any reason, you must cancel by November 14th or you forfeit the privilege of participating in future ZGAS events. Space is limited, so apply early. If you have any questions regarding the event, please e-mail us at join.zgas@gmail.com. Are you taking the CPA exam soon? Don't know what you need for the CPA registration process? Interested in speaking to fellow alumni from one of the Big Four who are currently tackling the exam? Come join PwC and Becker for an afternoon panel in which current employees will answer any questions you may have about the exam. Get over your test prep jitters and learn how you can make the CPA process seamless. You will also have an opportunity to mix and mingle at the conclusion of the presentation. Please note that this is not a recruiting event. It is for graduate students only. Space is limited. Refreshments will be served. Have you ever wondered how much a company is really worth? Do you want to learn how you can use your accounting knowledge to decipher the apparent chaos of the stock market? Whether you want to strike it rich as a day trader or land a job in public accounting or finance, come to this event and the New York School of Finance will teach you the fundamental tools used to assess the soundness of an equity investment. Built around a full-length case study of Monster Beverages, the presentation will show you how to perform an analysis of that company's financial standing. We will walk you through all the major valuation techniques as done by professional Wall Street analysts. The 2-hour course will be taught by Baruch College alumnus and seasoned Wall Street professional Luis Romero. This event is for graduate students only. Are you aware that the Financial Accounting Standards Board (FASB) and International Accounting Standards Board (IASB) have been collaborating on a joint revenue recognition project for the past six years? Did you know that the final standard was issued this year? Wonder how the new rules are going to affect different industries and their respective business? Now is your chance to learn all about these key issues! The Zicklin Graduate Accounting Society (ZGAS) invites you to join three experts in the accounting and financial reporting field in their discussion of revenue recognition. Professor Norman N. Strauss, former Ernst & Young Partner, Mr. Jackson Day, Ernst & Young Partner (Americas Professional Practice Director - Accounting Standards), and Mr. Brett Rhodes, Ernst & Young Senior Manager (Americas Professional Practice), will talk on this “Hot Topic” issue in the accounting industry and share their professional perspectives on the change. The Zicklin Graduate Accounting Society (ZGAS) invites you to participate in “Speed Networking with Grant Thornton.” This event offers you the opportunity to have your questions answered and connect with representatives from the firm. Small groups of students will meet with two (2) professionals for five (5) 10-minute sessions and attain first-hand accounts on the company, the industry and the different service lines. The evening will end with an open networking session and refreshments. Registration is required and space is limited. Open to graduate and undergraduate students. Business attire is required. The Zicklin Graduate Accounting Society (ZGAS) invites you to our “Advisory Practice at the Big 4” event on Monday, September 8, 2014. EY and Deloitte are two of the Big 4 accounting firms that hold a strong position in the Financial Accounting and Advisory Services sector. EY offers assurance, tax, transaction and other advisory services. Likewise, Deloitte provides audit & enterprise risk, consulting, advisory, tax, and growth enterprise services. Have you ever wondered what it would be like to meet professionals and recruiters from two of the Big 4 firms at once? Now is your opportunity! Join us to learn how EY's advisory team is “building a better working world,” and Deloitte’s advisory team is “taking it to the next level.” Professionals from EY and Deloitte’s advisory practices will jointly share their exciting stories, so don’t miss the opportunity to learn from the best in the industry. Likewise, have your questions answered by EY and Deloitte’s professionals and recruiters about the firms’ practice, OCR positions and all else. RSVP is required. Your resume is required to register, as it will be provided to both Deloitte and EY, so please review it carefully before submitting. If you have any questions regarding the event please e-mail us at join.zgas@gmail.com. The Zicklin Graduate Accounting Society (ZGAS) invites you to participate in our “How to Land a Job Interview through OCR” Workshop with Jack Pullara. Want to leave a good impression on recruiters during On Campus Recruiting (OCR) this Fall? Wonder how to get an interview through OCR and ultimately an internship or job offer? Join ZGAS at our workshop with Jack Pullare and receive such useful tips and advice. Description: Meet the Big 4 and mid-sized accounting firms recruiting at Baruch College this fall. Open to all undergraduate/graduate accounting majors. Business attire required. Bring your resume and come early! Welcome to all the new and returning students! With the start of the fall semester we are excited to announce our first meeting. Learn what ZGAS has to offer, meet the Board, find out how you can get involved, network with other students and get a preview of our upcoming events. To better prepare you for the upcoming recruiting season, ZGAS will have two students speak on how they landed their summer internships and their experiences with both a Big 4 and a mid-sized accounting firm. When: May 07, 2014, 4:40 p.m. - 5:40 p.m.
Did you get an internship or a job offer? Come and learn about how to make the most of your internship or the first months on the new job! The Zicklin Graduate Accounting Society(ZGAS) and Graduate Career Management Center (GCMC) are coming together to provide you with simple tools and strategies to differentiate yourself from others and make the most effective use of this “get to know” time to carve out your own path to success. This 60 minute session led by our GCMC expert Jack Pullara has been designed to give you an insight into the challenges that lie ahead and the most powerful ways to turn those challenges into meaningful opportunities for a great future. *Jack Pullara is conducting two identical workshops: an afternoon session on May 1st at 12:30PM and an evening session on May 7th at 4:40PM. ZGAS is co-sponsoring the evening session. What is it like to work at a Fortune 500 company? On May 6, the CFO of Colgate-Palmolive, Dennis Hickey, will join us for a moderated Q&A session to answer your questions. Mr. Hickey received a Bachelor's degree from Baruch College and is a CPA. Outside Colgate, he is an active member of the AICPA and Financial Executives International. Dennis also serves on the Dean's Council for the Zicklin School of Business at Baruch College and Baruch College's Executives on Campus (EOC) program. Tweet your questions to ZGAS’s Twitter or LinkedIn account! Job$mart Career Hour: CPA Panel: Career Opportunities in Accounting We invite you to Job$mart Career Hour, a dynamic discussion led by successful, practicing professionals who come on campus to help students conquer the job market. You'll network and have plenty of time to get all your questions answered. In this session, EOC Mentors will share their experience and thoughts about career opportunities in diverse sectors of accounting. No RSVP Required. All students are welcome. Space is limited, so be sure to arrive on time. Time: 12:20 p.m. to 2:00 p.m. Interested in gaining interview experience with professionals and recruiters from the Big 4 and Mid-sized accounting firms? Come to ZGAS's signature "Mock Interview Event" for the unique opportunity to receive insider feedback and interview tips from established accounting professionals and recruiters. Build your connections and get a head start on competition before the recruiting season begins. Each student will get up to five 15-minute mock interview sessions, during which one-on-one interviews with recruiters and professionals will be held. Becker Professional Education will also be present at the event to answer questions regarding the CPA Examination and registration process, as well as offer tips on how to succeed on the exam. They will also be holding a raffle for Becker swag. Be sure to stop by and speak with a representative in between your interview sessions. Business attire is required. Refreshments will be served! When: Earth Week - Thursday, April 24, 1:00 p.m. to 2:30 p.m.
Are you as passionate about the environment as the Big 4 are? With a strong focus on the field of carbon accounting, the Big 4 now offer sustainability advisory services to help companies account for environmental risks and comply with new environmental regulations. Take our workshop and enhance your accounting skills by gaining insight into the hot new field of carbon accounting! Date: Wednesday, April 2, 2014, 6:30 p.m. - 8:30 p.m.
ZGAS is proud to sponsor "Speed Networking with KPMG." Don't miss your chance to see KPMG at their only Baruch College appearance this semester! Share your elevator pitch with tax and audit professionals from one of the "Big 4" and discover if KPMG is the firm for you. Why wait until Fall? Connect with KPMG now and get a head start on your competition! Groups of 3-4 students will be paired with a KPMG professional for as many as seven 10-minute networking sessions. Business Attire Only. Graduate Students Only. Space is limited. Deadline for Registration: Friday, March 21, 2014 11:59 p.m.
Are you the Rockstar candidate that top firms are looking for? Jaymin Patel, author of “How to Network Like a Rockstar”, will show you how to stand out among top caliber candidates by networking like a Rockstar! Jaymin has developed a “science” behind networking that is framed for the analytical mind of graduate and helps break down the nebulous concept of networking. He will share tips and tricks collected from dozens of MBAs, undergraduate students, and industry professionals on their journey to get their dream job – including his own personal successes and failures as an MBA Student and MBA Recruiter. EOC invites you to special event: Job$mart Career Hour: Get the Job: HR Insider Info Two successful, practicing HR professionals will share what hiring managers look for and give advice on: •	marketing yourself to potential employers •	writing outstanding resumes and cover letters •	landing an interview and interview skills Job$mart is a great opportunity to network with professionals and fellow students. You’ll have plenty of time to get all your questions answered. No RSVP required, but space is limited, so be sure to arrive on time. All students are welcome. Welcome to all the new and returning students! With the start of the spring semester we are excited to announce our first meeting. Meet the ZGAS Board, enjoy lunch, network with other students, learn about our upcoming events and all that ZGAS has to offer. The Zicklin Graduate Accounting Society is pleased to announce that we will be holding elections for officers to join us in the Spring 2014 term. Applications will be accepted until Sunday, February 9th, 11:59PM. Selected candidates will be contacted individually to interview for the positions, with final selection to follow shortly. • Gain experience and skills that will translate into assets for your future career. Potential candidates will receive an email on Monday, February 10th, with the time and location of their interview. Please come prepared with a 2-4 minute oral statement as to why you want to join the ZGAS Board or Internal Committee and how you can contribute to the society. Thank you for your interest in ZGAS! The deadline to submit an application is February 9th at 11:59PM! As the United States moves toward adoption of international accounting standards, the concept of “fair value” has begun to take a more prominent role in accounting and finance. What is fair value? Can it be objectively determined? Is the move towards fair value accounting a mistake? 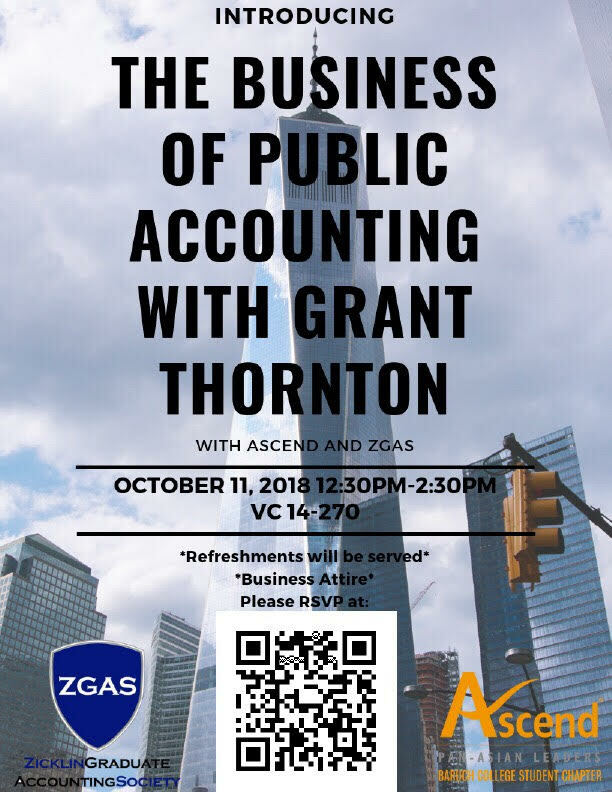 The Zicklin Graduate Accounting Society invites you to a special panel featuring speakers from E&Y, Morgan Stanley, KPMG and a distinguished Baruch Professor. Don’t miss this opportunity to gain invaluable knowledge from professionals in finance and accounting on a controversial and an important topic. How did you get that offer? Don't miss this opportunity to gain an invaluable insight from individuals who have received offers from a range of companies including the Big Four, RSM McGladrey and many more.